TickPick Reviews 2019 | Is TickPick Legit & Reliable Tickets? Is TickPick Legit, Reliable & Safe in 2019? 1. What is TickPick and is TickPick Legit? It’s a good idea to check TickPick reviews below to know if TickPick.com is a legit and reliable ticket source. TickPick is an innovative ticket marketplace created by live event enthusiasts that won the Industry Innovation Award from TicketSummit, an anual ticket industry conference put on usually in Las Vegas or New York. TickPick is an innovative ticket marketplace created by live event enthusiasts. One thing that stood out was TickPick using the latest technology to find you the best deal. 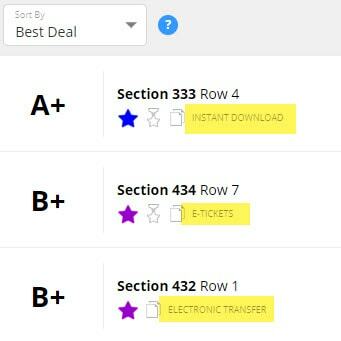 Tickpick’s best deal score system, which seems to be similar to SeatGeek in some ways, is based on price and seat location with what tickets are available on the market for most major and college sports, concerts and other live events like theater shows and plays. TickPick has a patented grading system to give you the best value. 2. What’s Good about TickPick? No hidden or added service fees at the checkout, which means lower ticket prices because, from research, most other ticket sites have 15-30% fees. The latest technology is used, which is a type of algorithm to find you the prices based on price and location. Think of Google search algorithm. It’s like a “Ticket Search Engine” that ranks the best ticket listings, so you don’t have to right? Other ticket marketplaces and websites have been known to charge up to 30% in hidden fees, but at TickPick you are guaranteed no extra added fees to get tickets at low prices. No hidden fees! Most sites charge 15-30% fees at checkout. This TickPick review must mention that overall TickPick takes the hassle out of trying to find good tickets at reasonable prices. The payment process on the checkout on TickPick is simple with easy payment options to pay with any major credit or debit card (Visa, Mastercard, American Express, Discover, etc.). What is great about TickPick is that you have a choice of buying tickets, or bidding. 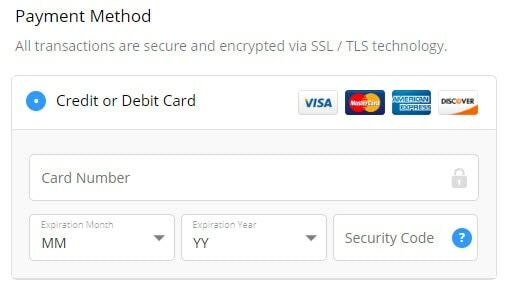 Hopefully, in the near future, PayPal will be added for just another safe and reliable option, like TicketMonster that allows you to checkout and order with PayPal. 3. What’s Not so Good about TickPick? There are a few negatives to mention in our TickPick review. When you are buying your tickets, you do not know your exact seat number. This is because ticket brokers could get in trouble if the exact seat numbers were revealed publicly. TickPick doesn’t show seat numbers to protect their sellers, which is understandable and in turn allows buyers to get the best deals. Another small inconvenience is that at times, you are unable to select the number of tickets you want. Brokers can specify what quantities their tickets are available in. 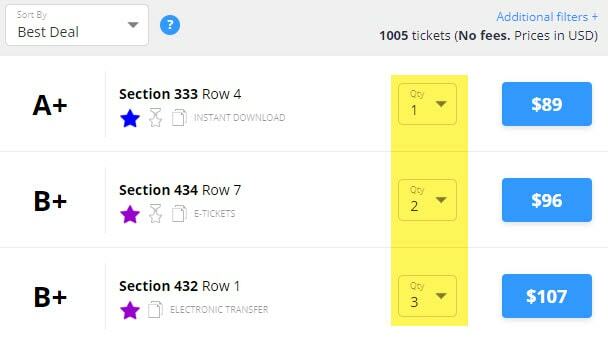 However, due to the large volume of tickets available for most big events, it’s likely that you will be able to buy the number of tickets you want in the sections you want. All sales on TickPick are final, in less event is canceled and not rescheduled. We noticed complaints from customers who stated when buying tickets outside the United States that delivery was longer, or delayed. It appears those customers did receive their order and tickets on time before their event or show though. We would highly recommend if you are traveling far to get to your event, like 3-6 days before, you should try to find tickets that you can just download at home. This way there’s no waiting for the delivery in the mail, hoping they come before your trip. When you are buying your tickets, you do not know your exact seat number. 4. Overall: Is TickPick Reliable, Good, and a Safe Site? Overall, TickPick is a real and legit ticket marketplace that started in 2011. They have a fantastic concept, and it works out well for everyone involved. Sellers have a great and safe platform to sell their tickets making. Buyers can get the best seats at the best prices available. The fact that you can choose what you are willing to pay for tickets to any given sports game, concert, theatrical performance or event is brilliant. There is even a bidding tutorial which is perfect because you can learn about how to bid whether buying or bidding is a better option for you based on your needs. Q Is TickPick a Reliable Ticket Source? TickPick, founded in 2011, has had a good reputation since then for delivering on their promises. That means that TickPick is a reliable ticket source that can come through with authentic tickets which will arrive in time for the event or your money is refunded. 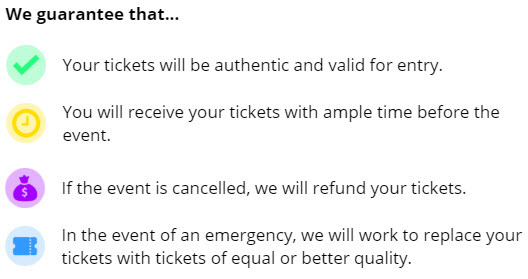 The company will always do everything in its power to find you comparable or better replacement tickets in the event that is a problem with the ones that you were issued, but if they aren’t available, TickPick will make sure that you get your refund as soon as possible. Q Is TickPick a Legitimate Site? Due to the fact that there are so many other ticket selling websites out there that have no problem taking advantage of their customers, a lot of people naturally wonder if TickPick is a legitimate website. The answer to that question is an unequivocal yes and there are plenty of happy TickPick buyers to prove it. They have a rock-solid guarantee in place to protect their customers from scammers and in addition to that, the company is an accredited member of the Better Business Bureau with an A+ rating for customer satisfaction. It doesn’t get much more legit than that. Q Is TickPick Safe or a Scam? TickPick is a safe website for ticket buyers because the company uses the latest standard security features that make it impossible for hackers to access your sensitive information. In the event that there’s ever a problem with a purchase or if you have any concerns about the security of TickPick, there’s a toll-free number on the website that will get you a real human being with real answers to your questions. Finally, when it comes to your privacy, TickPick promises not to share your email address or anything else with an unauthorized third-party, no matter what. Q What is TickPick's Guarantee? The TickPick guarantee makes it clear that buyers will receive their tickets well before the date of the event and that if they don’t have them by three days before the event, they should contact customer service to find out what’s going on. All tickets sold on the TickPick site are covered by the BuyerTrust Guarantee, which also states that the tickets will be valid or the buyer will receive tickets of the same or higher value. If replacements can’t be found, or in the event that a show is canceled, the buyer will receive a full refund. I splurged and spent $642 to take my husband to a concert and purchased tickets from TickPicks for the first time. I do use other ticket agencies frequently and have never had the issues or the poor customer service from other ticket agencies that I have received from TickPicks. Originally, the concert I purchased tickets for was canceled due to performer illness and rescheduled. I could not attend the rescheduled date and the support desk explained they have a very strict “no refund policy” if show is rescheduled. BUT they would resell the tickets, could not guarantee they would sell, and I would not be guaranteed my full amount back, plus they would get commissions for selling the tickets I originally bought from them. Next, the rescheduled show was cancelled. The venue said all remaining dates for the year, including the rescheduled show, was canceled by the performer and refunds could be obtained from point of purchase. Upon getting a hold of a TickPicks service representative, the rep said he could see the confusion with venue stating to get refunds from point of purchase, he would he ask his manager. Upon returning the service rep said it was rescheduled to ten months later (July 2019) and he could not refund the tickets. Again, offering to resell them with no guarantee they would sell or I’d get full amount back. Lastly, after checking with the venue website, there is NOT a rescheduled date for ten months later posted anywhere with venue as TickPicks claimed. The service rep argued with me that no other ticket agencies would refund me either and their policies are the same. Again, an offer to try to resell the tickets I originally purchased from them was made, with no guarantee I’d get my $642 back, with no guarantee they would sell, and of course it would be less commissions if they did sell them. Again, beware of this company. It is horrible and their customer service is bad. Refusing to give a refund for a show that was canceled. Canceled shows are noted as refundable per their service agreement. They claimed the show was rescheduled for ten months later, to avoid a refund. When questioned, the answer given was they would have to pay back the original seller $642 and that was too hard for them to do so. I will be disputing this, but please save yourself a hassle and do not buy from TickPicks. Very pleased with TickPick,I was skeptical at first so I emailed the company asking questions. I purchased tickets for a hockey game for Sept 28th. I bought the tickets today and the tickets were emailed to me within two hours. Great prices and great customer service. I never used tickpick.com before, but a friend recommended them. Overall, it was a good experience I’d say, besides having to pay more then I wanted to. Bought tickets and had a good experience. Despite what it says above the tickets I bought actually did provide seat numbers before hand. It seems like it’s up to the seller whether they want to display seat numbers. I’ll be back again for my next event. What I really like about tickpick is their bidding service on tickets that’s available. You don’t always get what you ask at first, but I like their selection of tickets, which there is a lot to choose from. I’ll be back again for my next event.